The Great Smoky Mountains on the border with North Carolina are part of the Blue Ridge mountain range (Appalachian Mountains). Where in the United States is Tennessee? Location map of Tennessee in the US. The landlocked US state is situated in the central southeastern United States. Tennessee borders eight other US states, Kentucky and Virginia to the north, North Carolina to the east, Mississippi, Alabama, and Georgia in south, Arkansas and Missouri along the Mississippi River in west. The states nickname is "The Volunteer State". Tennessee consists of 95 counties. The area of Tennessee was originally part of North Carolina. In 1790 North Carolina ceded the area to the United States. Admission to the Union on 1st June 1796, it was admitted as the 16th state. Tennessee was the site of many Civil War battles, including those at Shiloh and Chattanooga. 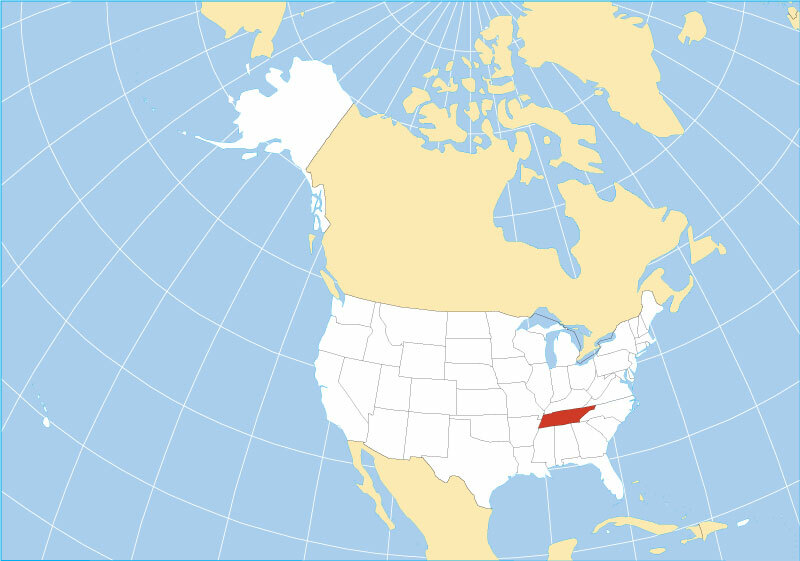 Tennessee occupies an area of 109,152 km² (42,144 sq mi) , compared it is about the size of Bulgaria or Cuba. Compared with other US states, Tennessee would fit into Texas more than six times. The state has its own special geographical and cultural feature, its called the "Grand Divisions of Tennessee". The three grand divisions are East, Middle, and West Tennessee. 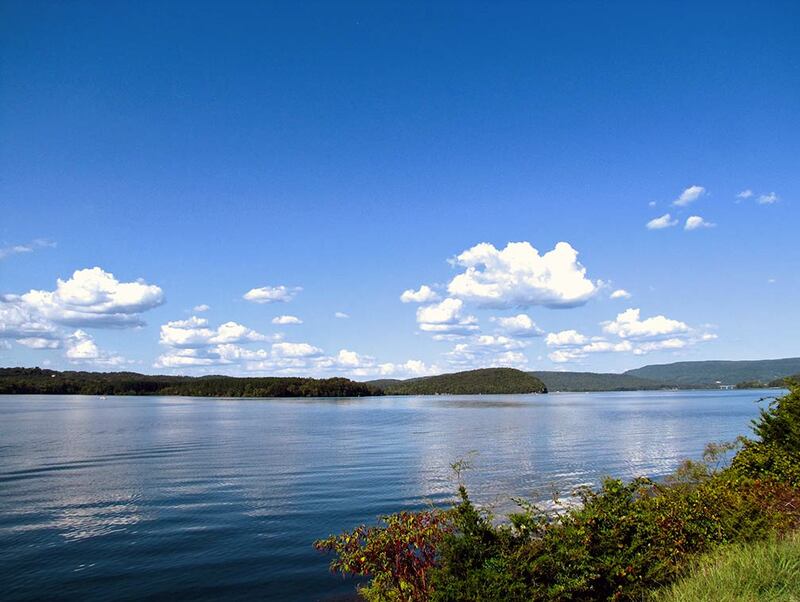 Nickajack Lake Tennessee is a reservoir created by Nickajack Dam on the Tennessee River. I. East Tennessee is dominated by the Cumberland Plateau, the southern part of the Appalachian Plateau, within this mountainous area there are East Tennessee's principal cities Knoxville, Chattanooga and the Tri-Cities (Kingsport, Johnson City and Bristol). East Tennessee is almost entirely in the Eastern Time Zone (see: US Time Zone Map) while the rest of the state uses Central Time. II. Middle Tennessee lies west of the Cumberland Plateau, it features rolling hills and fertile river valleys and the state capital Nashville as well as Tennessee's largest metro, the Nashville Metropolitan Area with 1.6 million people. III: Between Tennessee River and the Mississippi lies West Tennessee, a mostly agricultural region except for the state's second largest city Memphis. Highest elevation in the state is Clingmans Dome 2,025 m (6,643 ft), a mountain in the Great Smoky Mountains (part of the Blue Ridge) on the border with North Carolina in east. Tennessee shares one UNESCO World Heritage Site with North Carolina. The Great Smoky Mountains National Park is a major North American refuge of temperate zone flora and fauna that survived the Pleistocene glaciations. 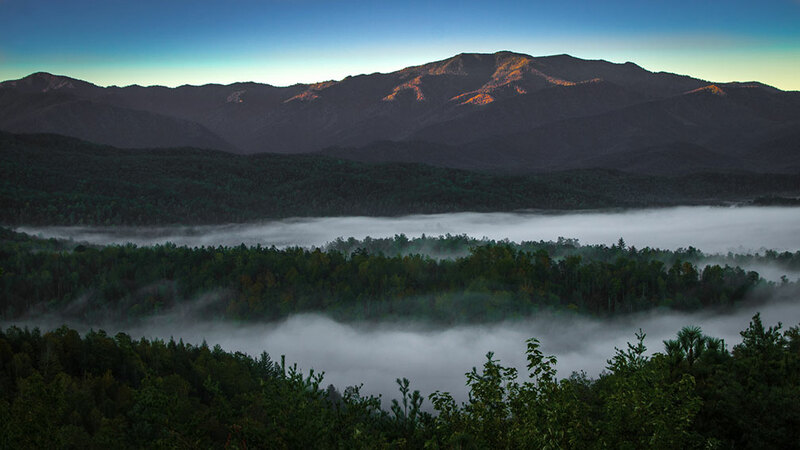 The park covers an area of over more than 200,000 ha centered on the ridge line of the Great Smoky Mountains, a subrange of the Appalachian Mountain chain. The main park entrance in Tennessee is at Gatlinburg, and in North Carolina at Cherokee. 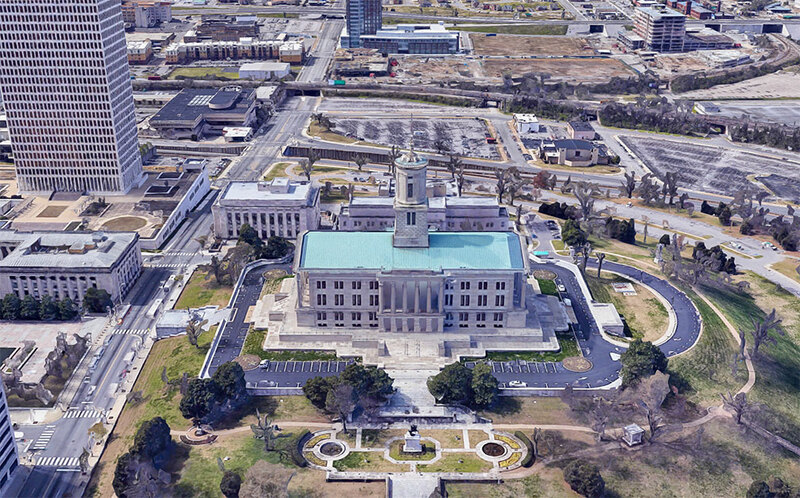 Rendered image of Tennessee State Capitol in Nashville. The National Historic Landmark building is home of the General Assembly of Tennessee. Tennessee has a population of 6.7 million people (2018 est.) . Capital and largest city is Nashville, largest metro area is Nashville metropolitan area. The city is located on the Cumberland River in northern Middle Tennessee. Other major cities are Memphis, Knoxville, Chattanooga, Clarksville, and Murfreesboro. Busiest airports are Memphis International Airport (IATA code: MEM), and Nashville International Airport (Berry Field; IATA code: BNA). The Delta Queen, a famous sternwheel steamboat and a National Historic Landmark. 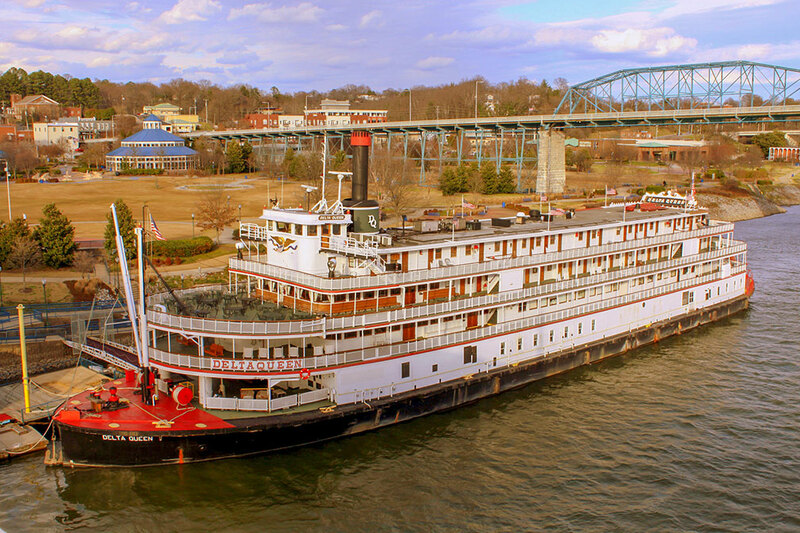 The riverboat was moored in Chattanooga, Tennessee serving as a floating hotel. Athens, Bolivar, Bristol, Brownsville, Cleveland, Columbia, Cookeville, Dickson, Dyersburg, Fayetteville, Franklin, Gallatin, Gatlinburg, Germantown, Greeneville, Hendersonville, Jackson, Johnson City, Kingsport, Lawrenceburg, Lebanon, Lexington, Linden, Livingston, Martin, Maryville, McMinnville, Milan, Millington, Morristown, Newport, Oak Ridge, Oneida, Paris, Portland, Pulaski, Savannah, Selmer, Shelbyville, Smyrna, Tullahoma, Union City, and Waverly. Skyline of Downtown Nashville at the Cumberland River during blue-hour, seen from the Korean War Memorial Bridge. 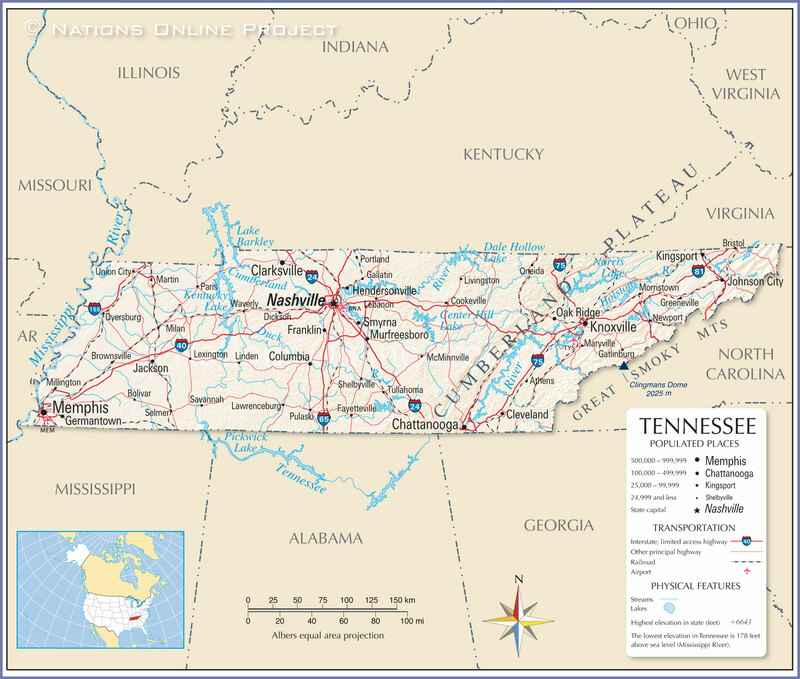 The detailed map below is showing the US state of Tennessee with boundaries, the location of the state capital Nashville, major cities and populated places, rivers, streams and lakes, interstate highways, principal highways, and railroads.